In the mid to late 1980s Grand Prix motorcycle racing began to be dominated by multicylinder, high tech machines that left no place to go for many manufacturers who didn’t have such a base model in their line-up. To fill the void the Battle of the Twins was formed to give British, European and American manufacturers a place to race and develop their thunderous two cylinder bikes. But it wasn’t just the major manufacturers who took part, without the category we would never have come to appreciate the work of the late genius, Kiwi, John Britten. 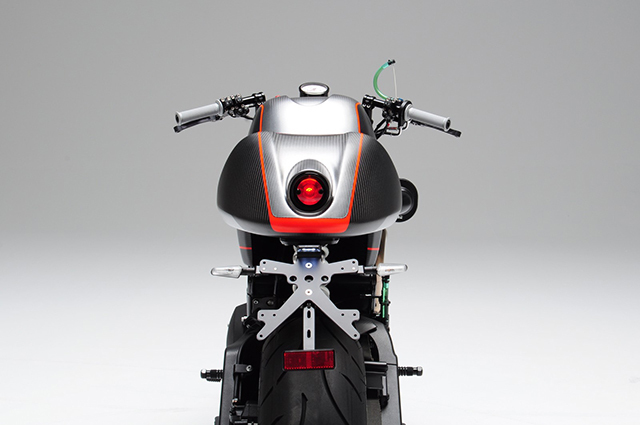 Inspired by Britten and other incredible men of the motorcycle business, Race Engineer David Sanchez started Bottpower, an acronym for Battle of the Twins, to express his own ingenuity and unique designs. 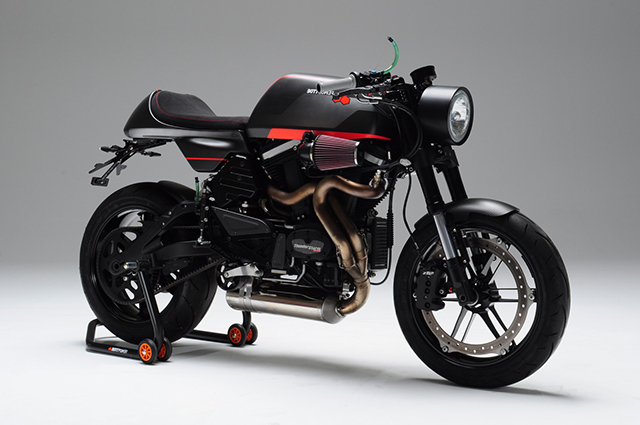 His latest creation is this incredible BOTT XC1 Carbon Café Racer; an engineering tour de force that would have David’s hero’s giving him a standing ovation. 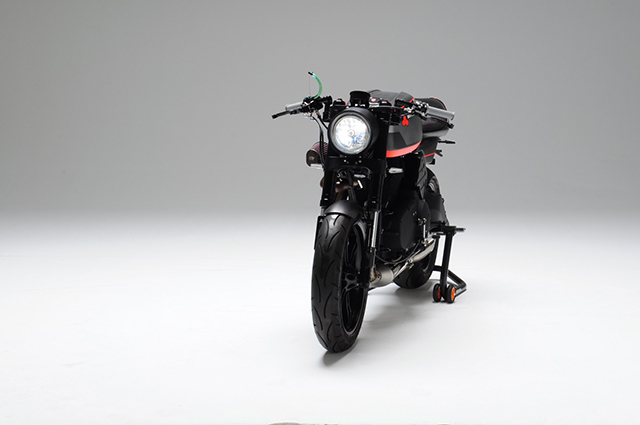 The result is a number of incredible prototype machines, one-off race and street bikes and a number of limited series machines. 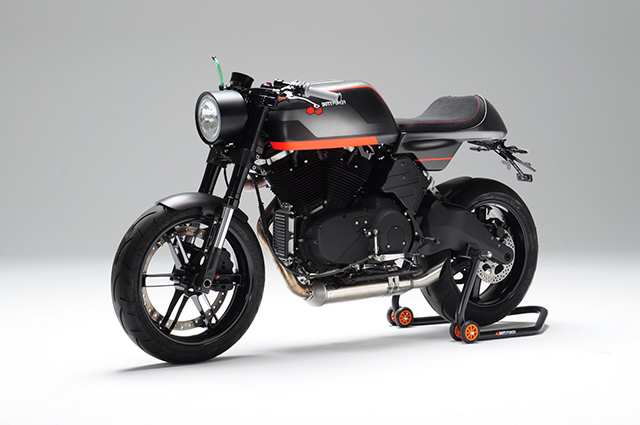 The most popular of which has proven to be the XR1 and XC1 Kit Bikes and this latest example of an XC1 has been built for the companies French dealer, Paradise Motorcycles. The bike will soon be on display in their shop in Paris, just in front of the Arc De Triomphe, a fitting place for such an amazing creation. 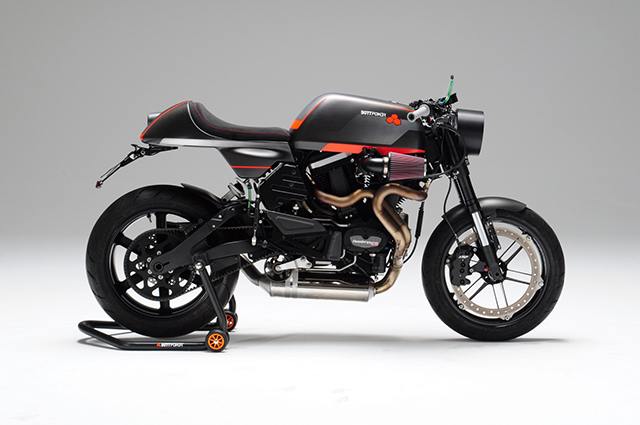 But David doesn’t modify bikes, instead his kits simply use some of the basic components of a modern motorcycle and the X kits take their drive train from Buell’s XB range. 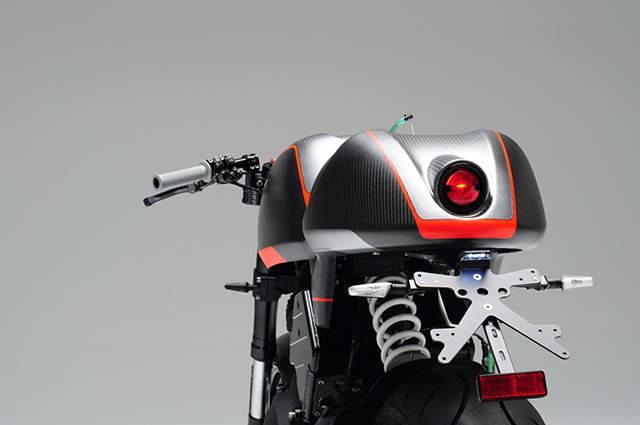 “We love the look and the character of Harley and Buell engines, and we focus on performance and on building light bikes” The donor for this creation is a 2010 Buell XB12SS and some of the design comes from an old friend who David met through his original website, well known Dutch industrial designer Hugo van Waaijen who came up with the tank and tail combo. But it all starts with a Bottpower central spine steel frame that does away with the standard Buell’s twin spar fuel carrying item. 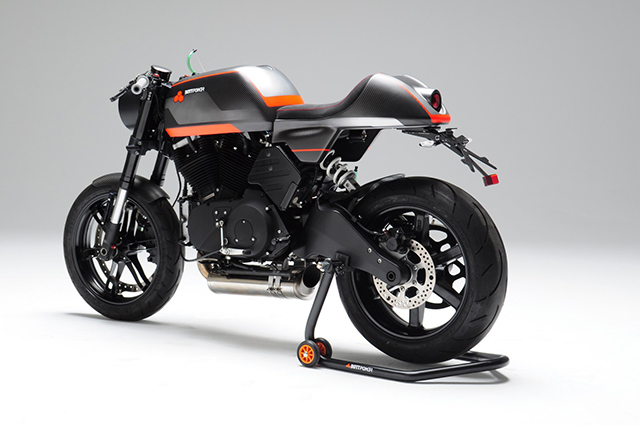 The frame alone is a piece of art, although the kit works with any Buell XB, it shares the geometry of the 12SS and with precision CNC machined parts, incredible TIG welding and designed using finite element analysis the end result is remarkable. The engine now becomes a stressed member and with all the bearings, bolts and fixtures the black powder coated frame is ready to accept the Buell driveline. That engine is the thunderous 1203cc, 45°, V-Twin that with a stroke of 96.8mm might not rev like a modern superbike but it creates enormous amounts of torque from the very moment you crack the throttle. The centre spine frame means the normal induction tract simply wouldn’t fit, so David has worked on a redesign of the throttle body, which rotates it to protrude out of the right hand side of the bike where a large K&N filter can gulp down copious amounts of air to fill the chambers. To reduce weight and extract some more ponies the headers have been changed out for a set of titanium items and the underslung muffler from Torque Hammer gives an incredible sound. To match the modifications the ECU has been re-mapped and if a customer isn’t satisfied with that level of performance there is also a big bore kit available, more engine tuning and ported heads that can be optioned on. To keep this XC1 running reliably in the Parisian summers the oil cooler is relocated to the front of the engine and is fed by braided lines all neatly hidden by a custom shield. So now you’re probably thinking if the fuel is no longer stored in the stock Buell frame then it must be all in the tank mounted in a traditional location. But that’s where you’d be wrong as David’s engineering and racing background has taught him that being able to determine where you put weight and not be dictated to by convention makes for remarkable dynamic improvements. So while there is some fuel in the top tank the rest is centralised and lower down in two auxiliary tanks mounted under the rear shock. From the outside they appear to be simple black side covers, but the two additional tanks get the weight just where you’d want it to be and give a total fuel capacity of 13 litres. 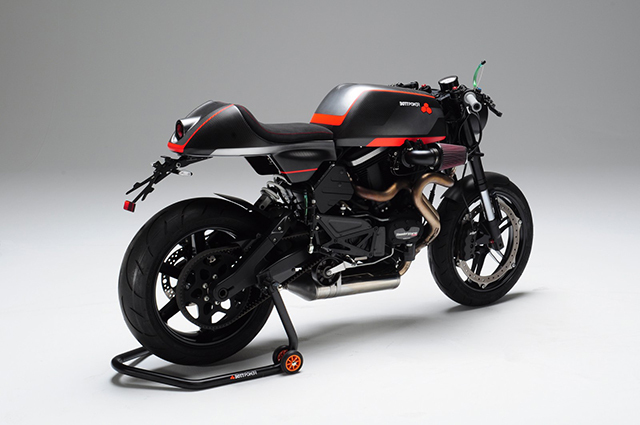 Both tanks are formed from a combination of alloy CNC machined parts and aluminium sheet metal, with the tank on the left side housing the factory Buell fuel pump. 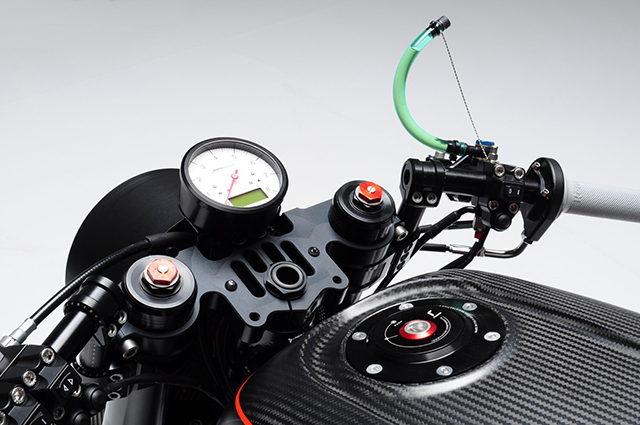 The carbon fibre tank is constructed with the use of an autoclave and is truly of the highest quality, finished out with a machined alloy filler cap. 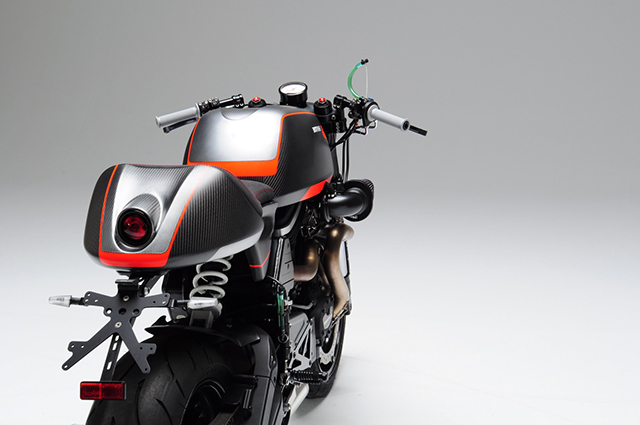 The tail piece is just as remarkable, beautiful flowing lines of carbon fibre create a truly modern take on the classic cafe racer styling and the flawlessly integrated taillight gives the sort of quality finish you’d expect only from the most elite of builders. 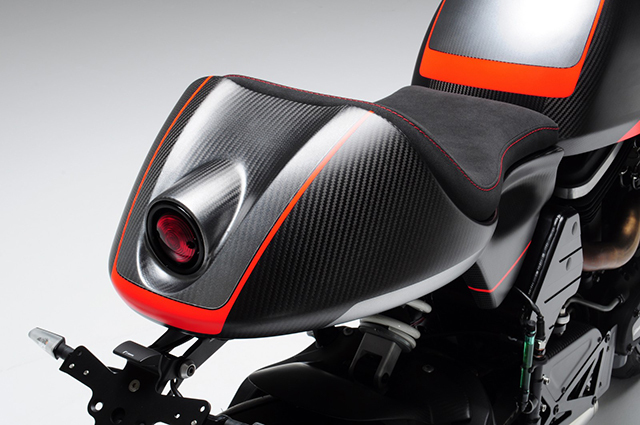 To really capture the lines the carbon is given an orange graphics package, company logo and pinstriping down the tail to accentuate the feminine curves. 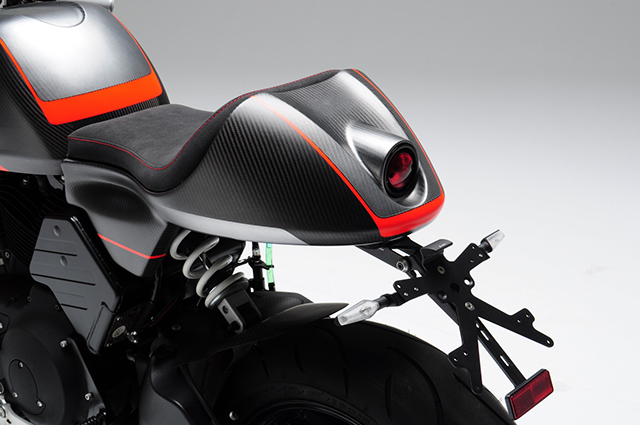 The carbon fibre use extends to other areas with the heel guards and 100% autoclaved carbon front fender all working to save a considerable amount of weight over the stock Buell. All of this means that the use of the factory Buell suspension makes perfect sense for the Bottpower kits and with less load to deal with they work to their full potential. The 43mm front inverted forks by Showa come with full adjustability to preload, compression and dampening and working with his test rider’s David has the perfect settings to suit the new lightweight Bottpower configuration. The Buell factory swingarm works seamlessly with the package and thanks to the fully adjustable mono-shock allows for the rear to be paired up with the steering end. Braking is handled by Erik Buell’s signature ZTL front brake, measuring a massive 375mm and all clamped by a single 6 piston caliper. The rolling stock is also from the donor XB Buell with its lightweight cast aluminium wheels now wrapped in some sticky Dunlop rubber. David keeps the fittings and fixtures to a minimum, such an amazing machine doesn’t need fancy bolt-ons to show off, but the parts he does use are world class. 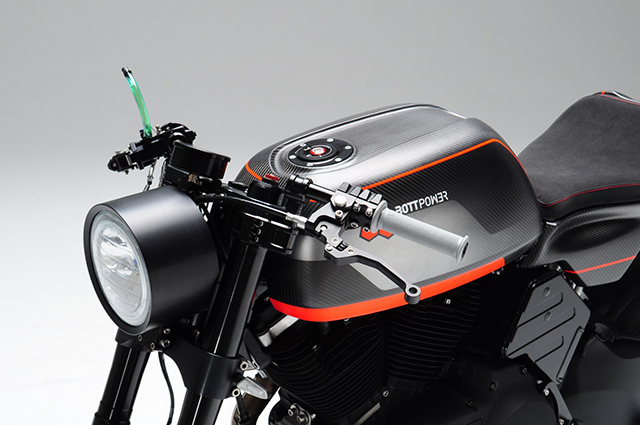 The single front headlight is straight from the Bottpower catalogue; using a one piece CNC machined aluminium body that results in an ultra-clean design with no visible bolts. A clever interface cable means the stock Buell loom is able to handle the classic Motogadget speedo and from the clips-ons to the levers and the rearsets, everywhere you look is high quality and absolutely only what’s required. 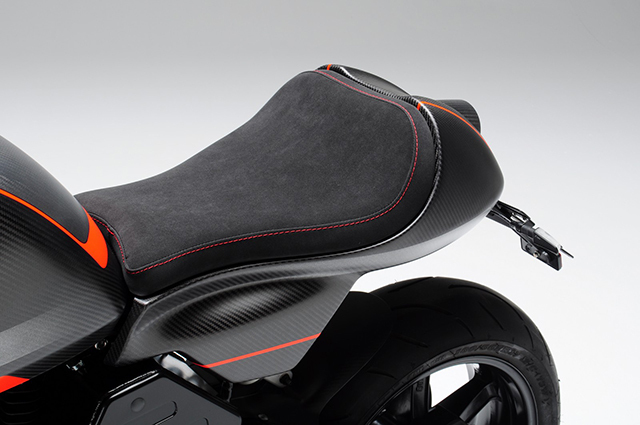 The final piece of the puzzle is the exquisite seat, hand stitched to match the pinstripping that hugs the contours of the carbon tail section and provides all the comfort you need for hours of rip roaring fun in the saddle. 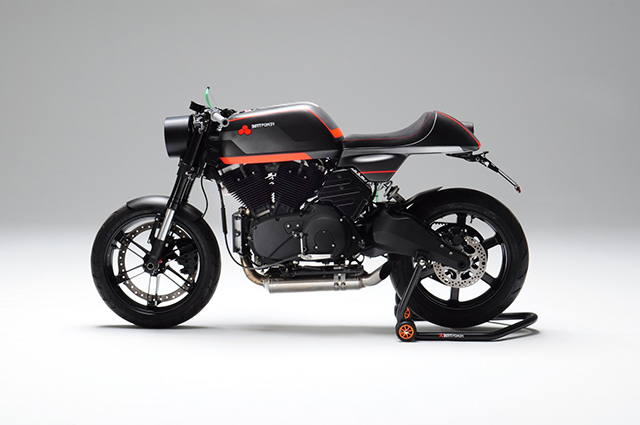 What David has created in the XC1 is a first class component kit that finally does the American Sportsbike drivetrain justice and truly brings the Cafe Racer philosophy into the 21st century and beyond; or as the French dealer who owns this machine would say simply, c’est magnifique!